Just a quick note this evening... 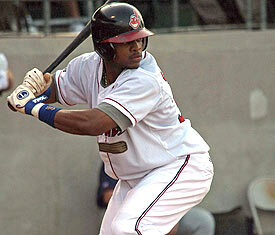 Doesn't Carlos Santana "look" like a good hitter? I'm not talking about the gaudy minor league stats, his minor league MVP awards (plural), nor his successful start in his first three Major League games. I'm specifically talking about the way Carlos Santana stands in the batters' box: crouched a bit, hovering over the inside corner, and easily whirling the bat high in the air & behind his head as he waits to unleash wicked fury. He keeps his weight back and holds that power in his core, until he throws his hands and bat head at the ball. Fantasy players who don't have Mauer, McCann, or Buster Posey should be all over this kid. Even if you have one of those guys, it could make a lot of sense to pickup Santana. Keep in mind, depth at catcher is underrated because most catchers fade a bit at different parts of the 2nd half. If you have two capable backstops, you'll have the luxury of playing the best matchup, while being well prepared to handle routine days off and injuries.